Obverse: Crowned King Edward III armoured with sword in right hand over shoulder and shield in left hand standing in ship sailing right, shield with quartered arms of England and France, ropes 3 / 3. Text around EDWARD DEI GRA REX ANGL Z FRANC D HYB, annulet stops. Reverse: Floriated cross with lis at end of each limb, crowned lion at each angle, within tressure of eight arcs. Text around IHC TRANSIENS PER MEDIVM ILLORVM IBAT (But Jesus passing through their midst went His way), double saltire stops. 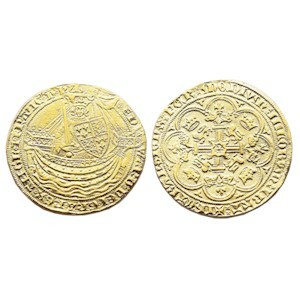 History: The first gold coinage of Edward III was not successful and it was replaced by the Noble, valued at 6s 8d, i.e. 80 pence, half a mark or one third of a pound, together with its fractions. The Noble was lowered in weight in two stages over the next few years, being stabilised in 1351. With the signing of the Treaty of Bretigni in 1360 Edward’s title to the Kingdom of France was omitted from the coinage, but it was reinstated again in 1369. This coin would have been struck just before the treaty was signed.